OKENYO was brought up in Australia - half Australian, half Kenyan. She is a theatre and TV actress and started composing songs around 4 years ago. She signed to the prestigious Australian Label - Elefant Traks over a year ago. OKENYO played at CMJ Festival to launch her music career a few years ago, has played Splendour in the Grass, supported Santigold and is about to play Bigsound in September. OKENYO is an vocalist based in Sydney whose beautifully poised and deeply evocative storytelling is enriching the waters of neo-soul and pushing the boundaries of pop music. Enigmatic, mysterious and evocative in her lyricism and storytelling, OKENYO, emerges from the pack as a uniquely charismatic artist, part of a new generation of powerful women set to make their mark. OKENYO began to turn heads both here and Internationally, described by HUNGER TV (UK) as “Equal parts Frank Ocean, Grace Jones and M.I.A." 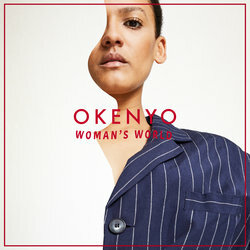 OKENYO’s new single 'WOMAN'S WORLD' (ALL CAPITALS) was released internationally on 19th July, with a worldwide premiere on BEATS 1, a major platform for such a new artist. This is the first single from her debut EP - set for release at the end of 2017. With power, truth and vulnerability, OKENYO gives you the unapologetic ‘WOMAN'S WORLD’. Its wry wit and complex wordplay ignites a movement; addressing the hypocrisies that women should try and fit into a man’s world, and calls upon the camaraderie of the female force.